We'll conclude our Earth Week observance with an optimistic view from 1968, the beginning of what was then vaguely known as the 'ecology movement'. 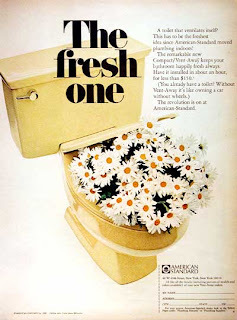 While this ad wasn't exactly conservation-oriented, it did address a form of pollution: indoor air quality. Promoting a self-ventilating toilet with a bowl-full of daisies was certainly an inspired use of the Flower Power bandwagon.